Do you always find your smartphone running out of battery at crucial times? Well, a power bank would definitely solve that problem for you! 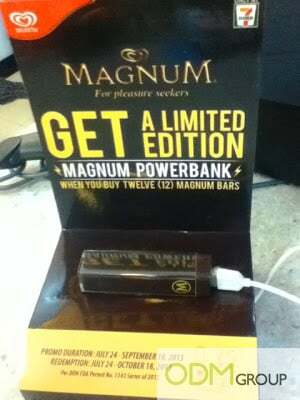 What could be even better than getting a free power bank while feasting on your favorite Magnum ice-cream? Magnum is giving away a limited edition Magnum Power Bank as a gift with purchase when you purchase Twelve Magnum bars at any 7-Eleven outlets! Most of the smart gadgets these days are extremely power hungry and can hardly last through the entire day. So we need a backup power device for our gadgets in order to ensure that we can stay contactable with the world. The Magnum Power bank comes in a shape of a Magnum Bar ice-cream, an attractive enough design to put a smile on someone’s face. Irregardless of whatever smart phone you might be using, you can be assured that this gift with purchase will help you last the day without any worry! So what are you waiting for? Hurry down to the nearest 7-Eleven outlet and get yours today! Magnum is the world’s first handheld ice-cream targeted as a premium ice-cream for adults. It is one of the world’s leading ice-cream brands, sell more than one billion units annually. Why Offer This Gift with Purchase? A Power Bank is actually a very practical gift with purchase for customers. This is especially so because almost everyone owns a smart phone in this era, making it a one product fits all kind of gift with purchase. Furthermore, the attractive design has a high chance of attracting younger children who might just get their parents to purchase it. Marketing using gift with purchase has always been one favorite method of marketing used by marketing managers. Such marketing methods create brand recall among customers, making them anticipate future promotions or arouse their interests about your product or brand.